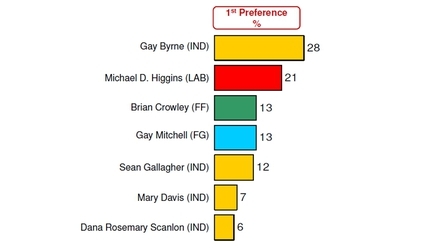 Gay Byrne's sudden coming and going from the presidential scene has left the obvious gaping hole of personality in the Irish presidential race that I speculated might develop in my last blog. With Norris and now Byrne now declared firmly out of the running, it looks as if the only thing that could spare us from the dreary prospect of having 'Michael D' (Higgins) instated as our next head of State is a Fianna Fail backed nomination for Bryan Crowley. However as Cathal Dervan notes for this website in his article earlier today here, Fianna Fail choosing to back Crowley is by no means even a certitude. Party leader Micheal Martin has been left with a decent smearing of egg on his face after Byrne's sudden decision to withdraw from the race, prompted, even by his own admission, largely by the media storm which followed quickly in the wake of his rash comments that 'mad, mad people in Europe' were running Ireland. Byrne's sudden expression of interest had been spurred largely by what has been a described as an 'encouraging' phone-call from Martin asking him to run, as well similar musings from other Party politicians around the country. Martin may come to regret the move. It was an unusual show of decision-making prowess and impetuousness from a politician better knowing for his ability to set up a dazzling array of committees than making shot-gun decisions. His immediate reaction in the wake of the fiasco to announce the deployment of a "sub-committee" to look into the matter of whether Fianna Fail should act on Crowley's expression of interest, or to commit to nominating a candidate at all, is a timely reversion to his more usual style of politics. Without a doubt it's an unfortunate end to Byrne's little flirt with the idea of running for the job. Although he wishes that the episode would just "go away" he would have been a reasonably likable president, but without him in the standings we're left with a desperate sense of foreboding that Michael D Higgins may just succeed in his bid. Higgins has thusfar played the media card extremely well. Unlike either Byrne or Norris he has deliberately chosen to avoid making any public pronouncements capable of courting public controversy whatsoever, taking care, at the height of the Norris fiasco, to proudly announce that he didn't engage in "that sort of politics" (referring to the smearing of Norris), but that's also what makes him so eminently uninteresting. Slightly further down the popularity table we have the almost equally dreary prospect of Fine Gael's man Gay Mitchell ascending to the throne, whose only endearing quality is that unlike Higgins he doesn't espouse a very anti-American worldview, which seems antiquated, contrary to Ireland's obvious trading interests, and a potentially direct blow to the sort of diaspora reachout that the government seems so eager to build on and foster. Independents Sean Gallagher, Mary Davis, and 'Dana', at 12, 7, and 6 of the Red C poll respectively, also seem to have done little to ignite public enticement about their respective bids or do anything to dispel the dearth of excitement now lingering around the race, though admittedly the fact that their manifestos have been shunted out of the limelight by the various fiascos could have a lot to do with this. With the way things are shaping up though, it's turning into a quickly jaded run for the Aras, and unless someone with a bit of charisma, ideas, and appeal steps into the race -- which Crowley could well turn out to be -- a sizable proportion of the electorate, this blogger included, could no longer really care who takes the prize this October.